Timothy Eddy has earned distinction as a recitalist, soloist with orchestra, chamber musician, recording artist, and as a winner in numerous national and international competitions. In 1975, Mr. Eddy received top honors at the Gaspar Cassado International Violoncello Competition in Florence, Italy. He has won prizes in the Dealey Contest (Dallas), the Denver Symphony Guild Competition, the North Carolina Symphony Contest, and the New York Violoncello Society Competition. In addition to numerous solo and chamber recitals throughout the USA, he has appeared as concerto soloist with the Dallas, Denver, Stamford, Jacksonville and North Carolina symphony orchestras. Mr. Eddy received his bachelor’s and master’s degrees with honors from the Manhattan School of Music, where he was a scholarship student of Bernard Greenhouse. He spent several summers as a participant in the Marlboro Music Festival and has toured the USA with the Music from Marlboro concert series. Recently, Mr. Eddy has spent his summers with the Santa Fe Chamber Music Festival, the Sarasota Music Festival and the Aspen Music Festival. In 1993, 1995 and 1997, Mr. Eddy was a member of the faculty of the biannual Isaac Stern Chamber Music Workshop at Carnegie Hall. 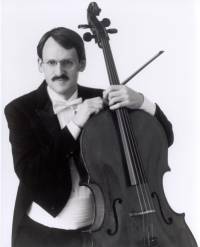 Presently professor of cello at the State University of New York at Stony Brook, Mr. Eddy will join the faculty of The Juilliard School in September 2001. He appears regularly in duo recital with pianist Gilbert Kalish, and is the solo cellist of the Bach Aria Group. As cellist with the Orion String Quartet he is in residence with the Chamber Music Society of Lincoln Center and at the Mannes College of Music. With the Orion Quartet he has appeared in major musical centers in the USA, Canada and Europe, including festivals in Lockenhaus and Mondsee, Austria; Spoleto, Italy; New York’s Mostly Mozart; Charleston, South Carolina; Turku, Finland; and Vancouver, Canada. Mr. Eddy has recorded for Columbia Records, Angel, Vanguard, Nonesuch, C.R.I., New World, Vox, Musical Heritage, Delos, Arabesque and Sony Classical. Mr. Eddy is highly sought after as a teacher, and his pupils have come from England, France, Germany, Holland, Australia, New Zealand, Israel, Japan, Korea, the USA and Canada. His students have won positions in major orchestra and universities in the USA, Canada, Europe and the Far East; many have also achieved distinction in their careers as chamber musicians and soloists.